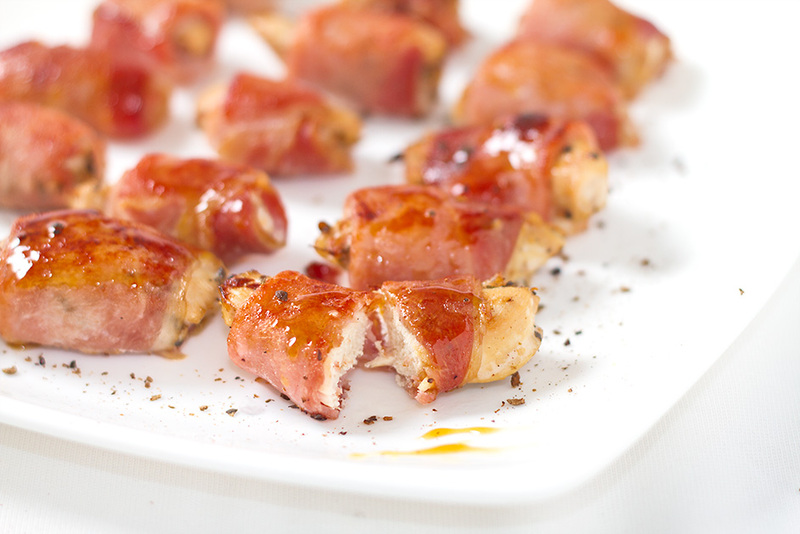 There are tens of recipes for making bacon wraps, but this bacon wrapped chicken recipe appealed to me because of the ease with which it can be made. What’s more, you can make these in advance and serve as starters before dinner or as an entrée for brunch. It is important to pick tender and juicy boneless chicken pieces and season it well before wrapping the bacon around them so that each bite is a burst of flavors. I used smoked, rind less backon which I would suggest you do too. If you have time on hand, give the chicken a special treatment by stuff each little chicken piece with a bit of cream cheese just before wrapping it with bacon. Make sure to secure the wrap well so that the cheese does not drip. You can substitute chicken with stuffed dates, or seasoned prawns. Cut the chicken into bite size and season it with allspice, pepper, salt, oregano and thyme. Keep aside for 15-20 minutes. Melt the brown-sugar with a bit of allspice. Add crushed red pepper flakes and dijon mustard. Stir well and keep aside. Preheat oven to 180 degrees C. While the oven is getting preheated, wrap each piece of chicken with bacon strip and secure it with a toothpick if needed. Lightly grease the baking tray and arrange the wrapped chicken pieces on the tray. As you arrange the wrapped chicken bites, baste each of them with the brownsugar/mustard mixture and bake for about 10 minutes. Serve with a sprinkle of Allspice.